You’ve probably heard of New York City and Long Island. But you may not be familiar with Suffolk County. 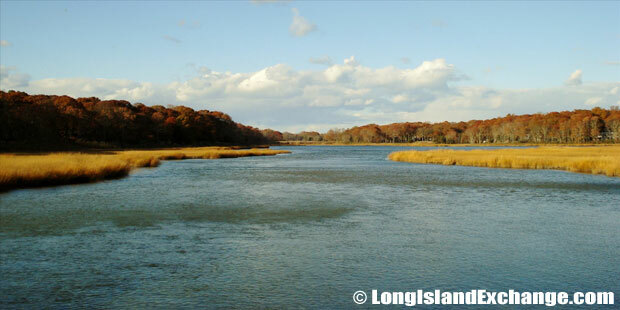 It’s one of the four counties that physically make up Long Island, New York. 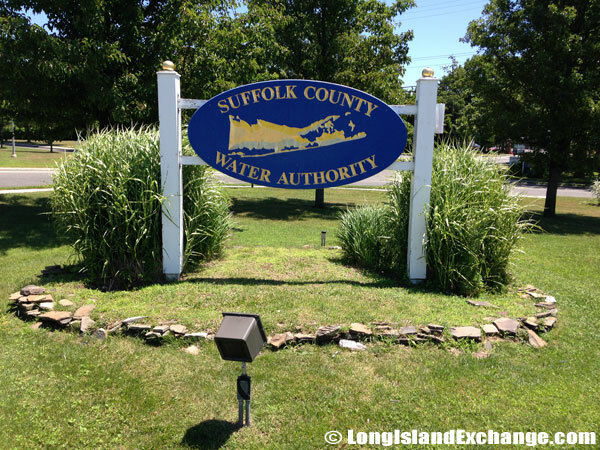 Suffolk County has a population of about 1.5 million. For decades, Nassau County had a larger population, but in the 1990 census, Suffolk surpassed it, due to the eastward movement of growth. People in Suffolk are diverse in origin and ethnicity, contributing to its rich culture. 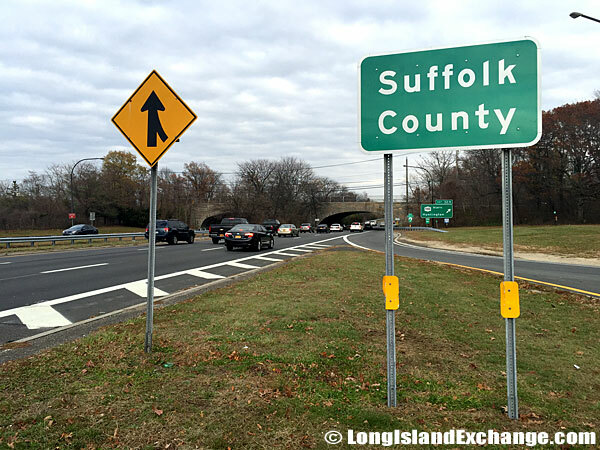 A sign on the south side of Southern State Parkway east welcomes visitors and residents to Suffolk County Long Island. The story of Suffolk is that a County must adapt to changing times. It converted unused meadows in to productive farms, provided timber for construction and harvested the Ocean for whale meat and blubber, when the English colony needed these inputs and in the decades after independence. However it was equally nimble to respond to housing needs between the two World Wars, and was quick to exploit rising incomes from the 1950s onwards to offer quality infrastructure for family life and recreation. Europeans migrated to the island, joining the Native Indians, who were probably the first inhabitants. The former brought transformations to the community livelihood. There was a shift from the primitive era of hunting and fishing, to developments in agriculture, commerce, and industry. The steady flow of development has been reliant on the Long Island Railroad and other road transport systems. These passages of development have opened Suffolk to the affluent eastern U.S. mainland. Although Suffolk adapted to the rigorous demands of the economy, preserving the environment has still been one of the county’s priorities. It is a place for diverse purpose — whether for business, permanent residence, or vacation. Suffolk’s people, of varied origins, actively involve themselves in the County’s policy making. Suffolk and Nassau, unlike Brooklyn and Queens, have their own governments, with County Executives as leaders. During recent years, the politics in Suffolk have become somewhat more progressive than during the past. 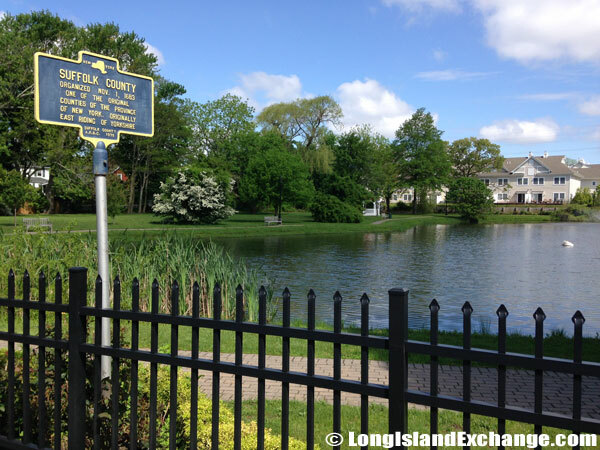 Historical Marker for Suffolk County, one of twelve original counties of the Province of New York created in 1683. It’s no secret that New York State is a Democratic stronghold, and Suffolk County is largely part of that perception. Three members, two of whom are Democrats, represent the county in the House of Representatives. Both of New York’s U.S. Senators are Democrats, and the county voted solidly for Democratic governors in the last two electoral cycles. 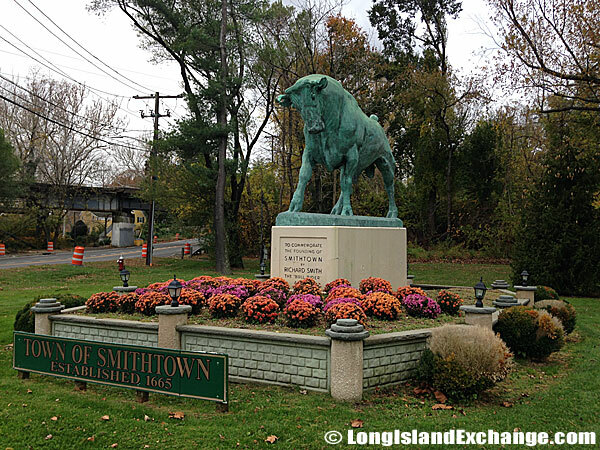 The Statue of Whisper the Bull, said to have been ridden by Richard Smith in order to claim the land that became the Town of Smithtown. Despite a predisposition toward Republicans throughout the early 20th century, Suffolk made the transition to more Democratic voting trends along with the rest of New York in the 1980s and 1990s. Today, the majority of registered voters in the county are registered as members of the Democratic Party. 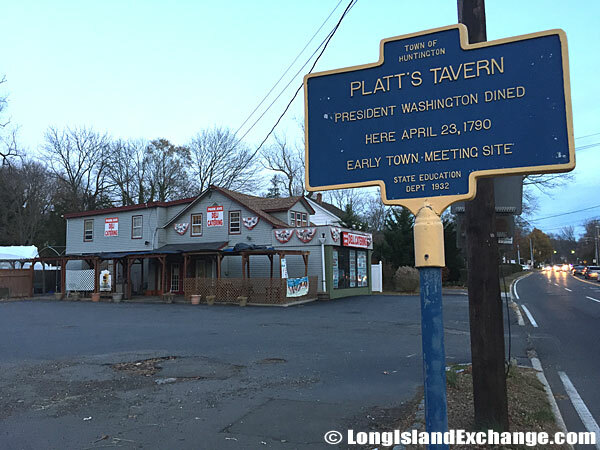 Historical marker for Platt’s Tavern in Huntington, where on April 23, 1790, President George Washington stopped, spoke and dined. The tavern, now the site of the Park Avenue Deli parking lot, was a social hub in the 18th century. 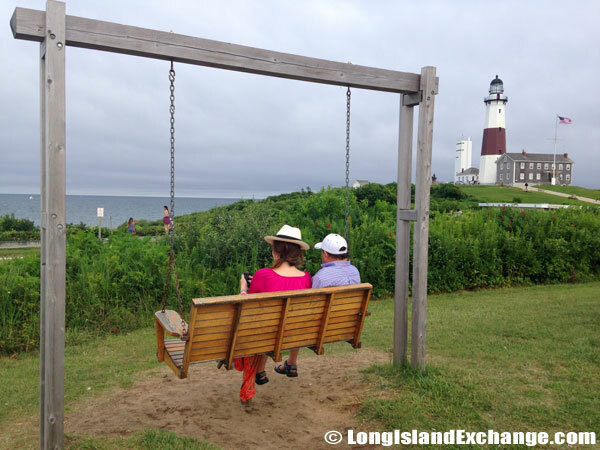 A couple sits at Montauk Point near the parking lot area and takes it all in. The Long Island Expressway serves Suffolk County and is the primary artery for cars traveling to and from locations in New York City and neighboring Nassau County. The Long Island Expressway is notorious for its traffic issues, however, and might not represent the best method of travel during peak times. Suffolk is also the home of the Fire Island National Seashore — a collection of long, narrow barrier islands–which has consistently ranked as one of the best coastal communities on the east coast for travelers and families of all kinds. Two ferries from Connecticut also serve Suffolk County, as does the relatively modest MacArthur Airport in Islip, NY. These options are less popular, though, especially among those relocating to the county on a permanent basis. Lighthouses, natural reserves, and parks for bird-watching or cross-country skiing abound in the area. This makes Suffolk County a favorite getaway of tourists, and especially New Yorkers, during the weekends. Suffolk is certainly balanced with managed growth and nature preservation. 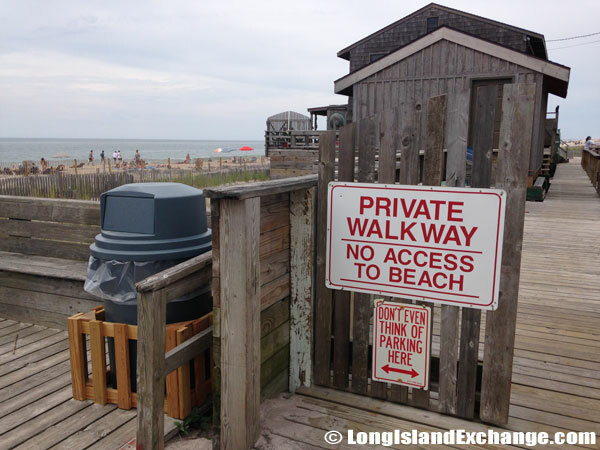 A prominent sign tells visitors that this section of Ocean Beach on Fire Island is private and that no access is aloud. It also suggests that beach-goers not even think about parking their bicycles here. Suffolk County should be applauded for housing some of the nation’s most opulent mansions, and refusing to discriminate against any interested buyers. It is one of the most far-removed counties from New York City, and is good for vacationers and retirees. The county’s transportation amenities make it particularly popular among this group, as no car is required for access to major parts of the county and its largest towns.